Former Long Jumper and assistant technical director of the Athletics Federation of Nigeria (AFN) Yusuf Ali has posited that straight life-bans for any one caught using performance enhancing drugs will help cleanse athletics of cheats. Speaking with AthleticsAfrica.Com in Lagos, Ali who holds the national record in the Long Jump men’s event for over two decades stated that once athletes are in the know that once they caught using drugs they will be banned for life, the punishment will serve as a deterrent to others. “For me I will want IAAF to be more firm and pronounce straight bans on any athletes found wanting. 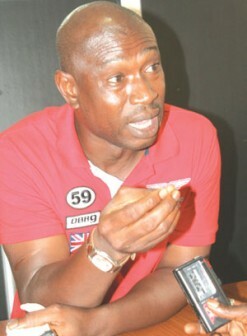 He continued: “Before, the rule in sprints allows you a second chance after a false start but since it was changed to just one chance,you can see that the issue of false starts have drastically reduced so I believe if they make dope cases same it will go a long way, Ali popularly referred to as ‘Skippo’ suggested. Only recently there were high profile dope cases in the athletics scene which saw the likes of Tyson Gay, Asafa Powell amongst others test positive to banned substances.